I just love Americana style home decor so when I saw the 3D star from the banner in SVG Cuts Made In The USA kit last year I knew I had to make it into a wall hanging. I enlarged the pieces so the whole size would be around 12 x 12 and I used the print 2 cut feature on my sizzix eclips to print the verse from I'm a Yankee Doodle Dandy, one of my favorite James Cagney movies. 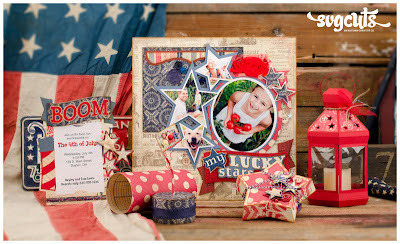 I found this Americana digital paper by Tracie Stroud Designs, http://scraporchard.com/market/Americana-Digital-Scrapbook.html, it's totally perfect for my project and I absolutely love it. Well after making the star I thought an american flag crate would look cute for my 4th of July cake pops, so I altered the crate from the Caramel Apple Pie Kit. I shortened the height on the crate boards and added three more for the stripes, a total of 5 on each side. The star piece is from the Main Street USA Mega Pack. Then of course I needed a card so I took the flower card from the Iris Fold Cards kit and created this star card. 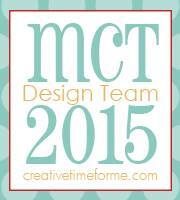 I must say I really love how they all turned out, love SVG Cuts files!! 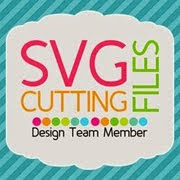 Did you know that SVG Cuts has a free download every week!! Check out their blog to access this adorable pinwheel and video tutorial! Here is my altered version for the 4th of July!! 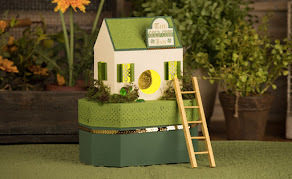 Don't forget to check out their wonderful kits and collections at svgcuts.com!! I love using the card base from SVG Cuts Mothers Garden, it's definitely one of my favorites. I made this Birthday Card using elements from both Edisto Island Cards and Breezy Backyard Lever Cards. 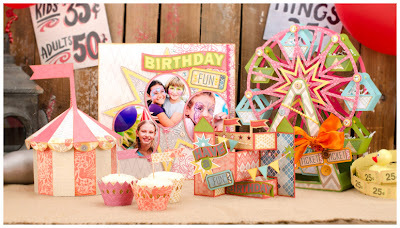 The cards that are in both of these kits are really pretty cards and can be used for so many different occasions. 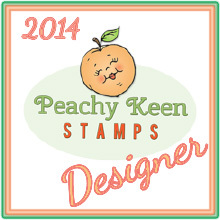 The tag was made using my Stampin' Up Ticket punch. 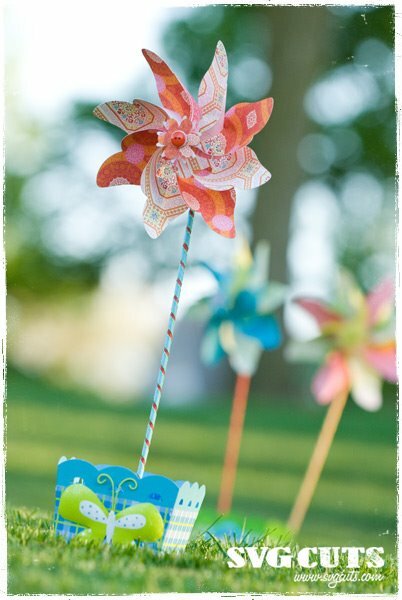 I used my McGills Paper Blossoms Tools to puff out the sails for a 3D effect. 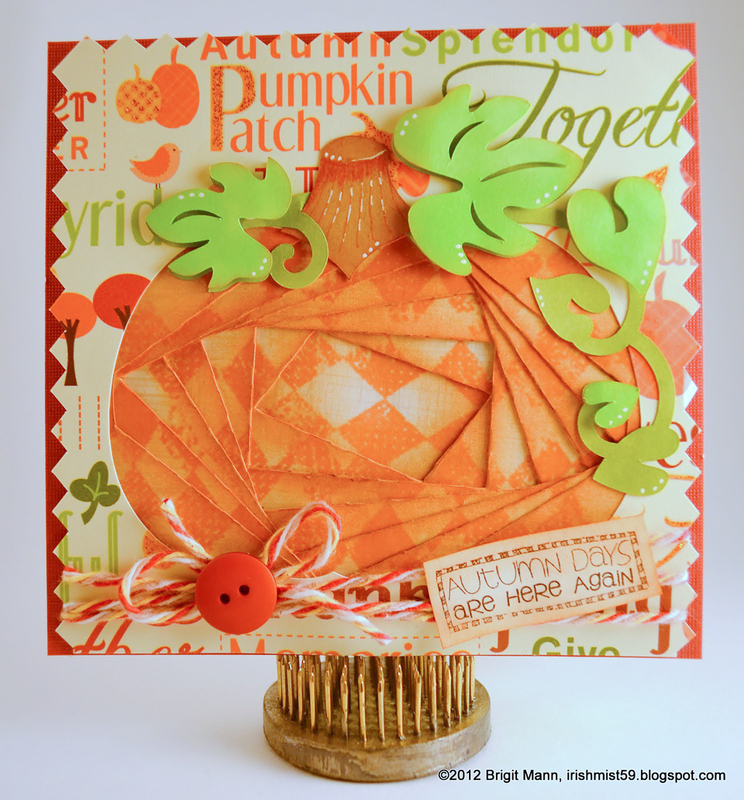 I know it's the beginning of summer but it's been really hot here the last couple of days and it made me think of fall and a card I've been wanting to put together. It's my favorite season and I never get bored of making any kind of autumn project especially anything with pumpkins!! 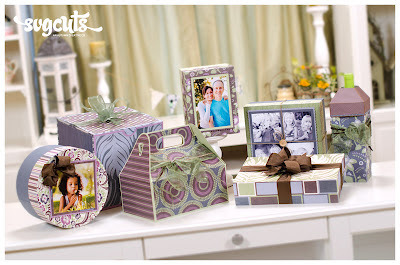 Get this kit FREE with a $9.98 purchase, use code FREEGIFT in the discount coupon section. 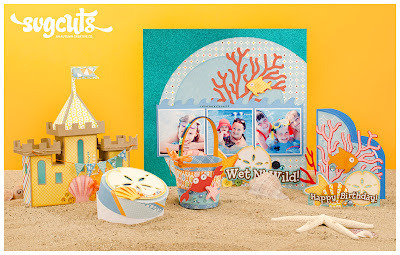 A Wet N Wild Party! When I first saw the new kit from SVG Cuts Wet N Wild I just knew I had to make this card. I was totally inspired by an ecard I had seen awhile ago that I just loved. All the pieces are from the kit except for the seahorse and eyes, I just used circles and sized them in ecals. 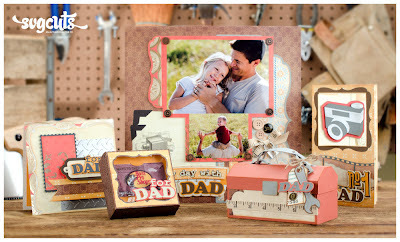 I just love the little gift card box in SVG Cuts new kit My Day With Dad, though the kit centers around Father's Day, the projects can easily be converted to any different occasion. I used the box for a birthday; a couple of balloons, a banner and some confetti sprinkled inside makes a quick and easy little gift card holder for somebody special. Candies inside would also make a nice added treat!